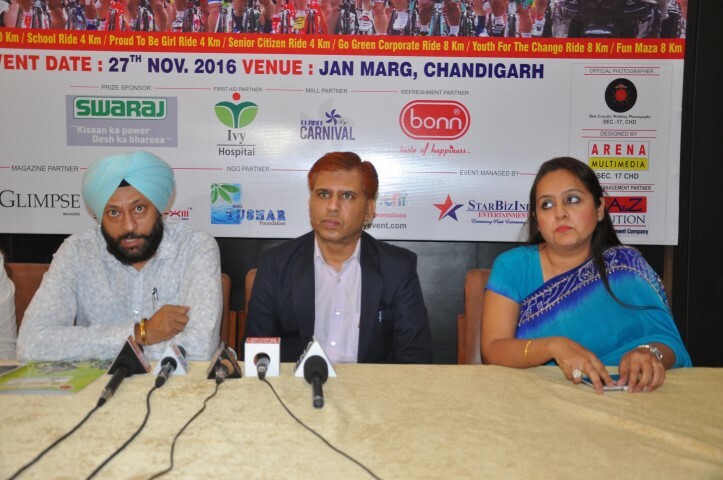 NewZNew (Chandigarh) : It is happening for a cause, for those 20 crore (approx.) people of the country who sleep daily without eating a single meal. A cause to serve those hungry stomachs. It is known as the Big Day Indian Hunger Challenge (BDIHC) which was founded by Gaurav Goyal on Sept 1, 2014. On Sunday, BDIHC organized a marathon at Sukhna Lake in the morning to support the same cause. Sanjay Tandon (BJP State President) and Naunihal Singh (IPS-DIG) flagged off the Marathon and participated in it. Approximate 400 people took part in this BDIHC Marathon 2014 from all walks of life. An awesome initiative and a kick start for the rest of day to support and promote Big Day Indian Hunger Challenge and wastage of food. Shekhar Kaushal assisted in execution of the marathon. Gaurav commented, “Being inspired from Ice bucket Challenge, BDIHC has gained a lot of importance in these 3 months. We are not asking for any kind of donations or charity but you just need to serve a meal to a hungry stomach, click a picture and share it on the Facebook page of BDIHC.” Within 3 months there are approx. 80,000 likes with more than 15,00,000 followers on this page and they have been a source of food to more than 45000 hungry stomachs and the number is still increasing. Various celebrities have performed Big Day Indian Hunger Challenge including Kapil Dev, Savita Bhatti, Hardy Sandhu, G Deep, Kamal Heer, Mehar Mittal, Monika Shail, Satish Katyal, Devinder Jaidka, Sukhdeep Singh and many other along with other famous dignitaries like Shanta Kumar (Ex CM Himachal Pardesh), Aarti Mehra (BJP National Secretary & Prabhari Chandigarh), Sanjay Tandon (BJP Chandigarh State President), Heera Negi (Senior Deputy Mayor, Chandigarh), Davesh Moudgill (Deputy Mayor, Chandigarh), and Harmohinder S. Lucky (Ex Deputy Mayor, Chandigarh). For this marathon, Garlic and Greens was the hospitality partner and arranged for food and beverages and Burn Gym was the Gym partner. SGA Real Estates P. Ltd., Libaas were among the main sponsors along with various others.